A.S.K. 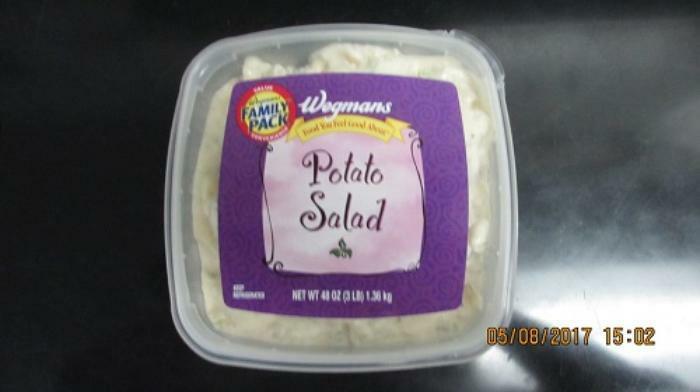 Foods of Palmyra, Pa., is recalling one lot of Wegmans Family Pack Food You Feel Good About Potato Salad. The recalled potato salad was distributed and sold at Wegmans Food Markets in NY, MA and Erie, PA. The recalled product, packaged in 48-oz. (3-lb.) clear plastic containers with a label on the lid reading, “Wegmans Family Pack Food You Feel Good About Potato Salad,” has the code “SELL BY: 5/7/17 3379-4” and is marked with UPC 77890 24678 on the side label. It was sold at Wegmans Food Markets in N.Y., Mass., and Erie, Pa.
Customers who purchased the recalled product and have an allergy or sensitivity to eggs should not consume it, but return it to the place of purchase for a full refund. Consumers with questions may contact Wegmans consumer affairs at 1-855-934-3663, Monday through Friday, from 8 a.m. to 5 p.m.